1. 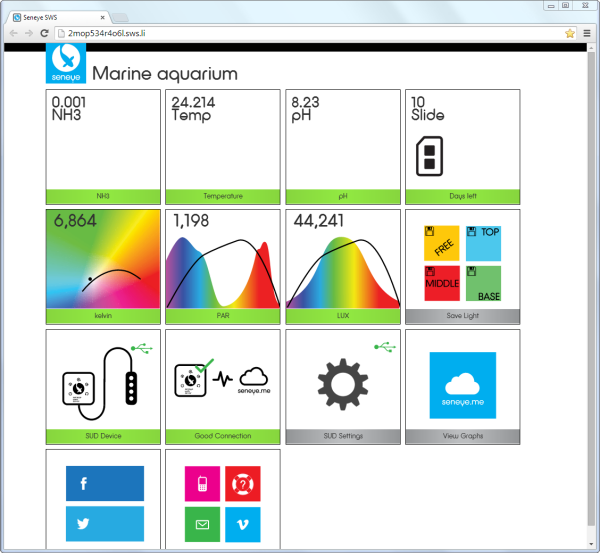 The Graphic User Interface (GUI) for your seneye is visible to any PC or Tablet on your LAN that has an HTML 5 supported browser. PC's or Tablets that are not on your LAN (ie connected by 3G) will not be visible. 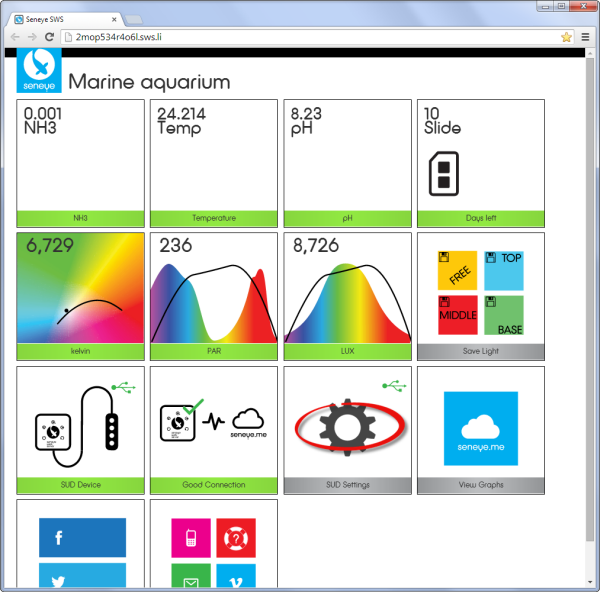 The Graphic User Interface (GUI) for your seneye is visible to any PC or Tablet on your LAN that has an HTML 5 supported browser. PC's or Tablets that are not on your LAN (ie connected by 3G) will not be visible. To find your GUI you will need to use the link that was provided when you first registered your SWS to your account. If you do not have this then you will need to add the address to a browser manually. The URL is unique, so your SWS and the part that is marked with **** on the address below needs to be replaced with the ID code that was on the label on the front of your SWS. The layout of the GUI is shown below. The readings from the SUD are shown on an individual 'Tiles'. Each tile can be moved by clicking on the bottom bar and dragging it to a new location. The other tiles will automatically re-stack in a new location. 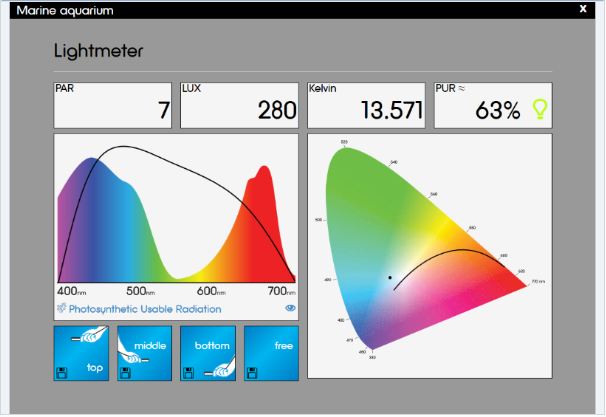 You can get a more in-depth view of the output from the light meter on the SWS GUI by clicking and holding the "save light" tile. This opens the page as shown below. There is some more information regarding the interpretation of the light readings on these pages. 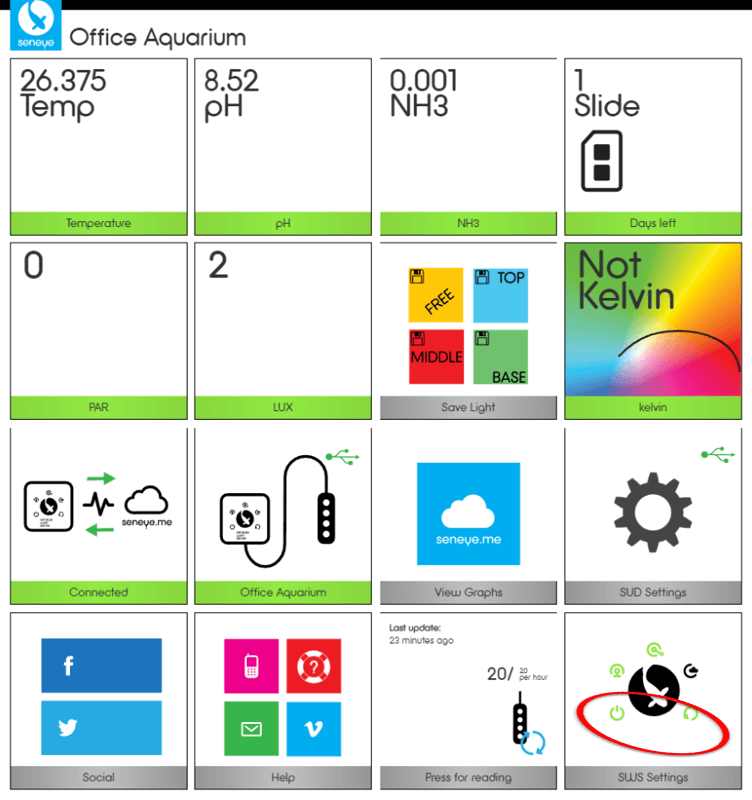 The "top", "middle", "bottom" and "free" buttons can be used to save light readings at specific locations. These are then visible on your seneye.me dashboard. This widget allows you to take extra readings on top of the standard readings taken every 30 minutes. You can only take up to 20 extra readings every hour. This allows you to make minor adjustments for each individual reading by using the blue sliders. The reading and the trimmed value are shown on the right hand side. 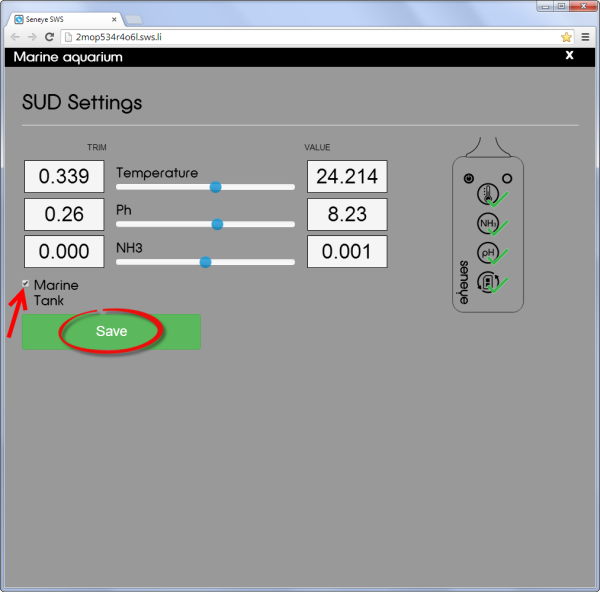 The 'Marine Tank' tick box (shown by the red arrow on the image above) needs to be set if you are using the seneye in a saltwater aquarium. If you do not tick this, the pH reading will report high. You can use the green ticks, shown on the right hand side of the display, to control the individual lights on the SUD. If you click on the tick, it will change to a cross and the light will be off all the time. You can change settings for your SWS by clicking on the SWS Settings tile. Allow autologin to your dashboard. Assign a static IP, default setting is DHCP. 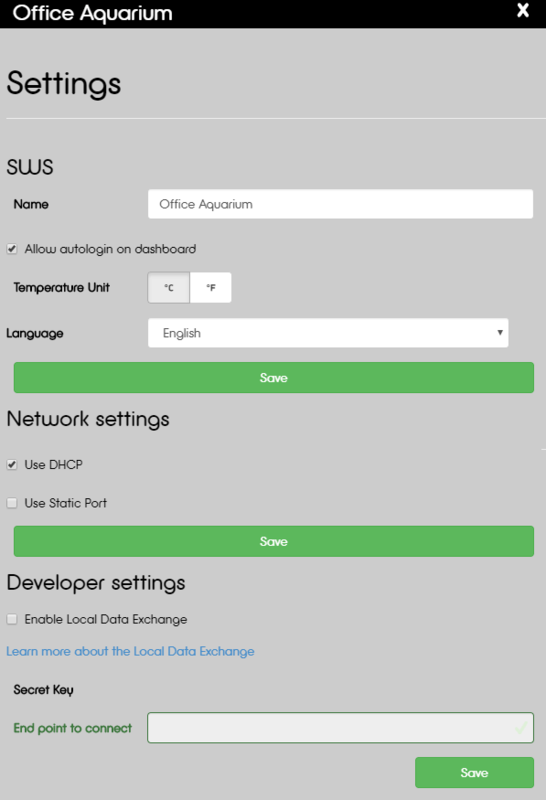 Enable the SWS for Local Data Exchange (LDE). Click here to learn more about the LDE capability of your SWS or SCA. NOTE: this feature is primarily intended for developers. Click the 'save' buttons to confirm your changes.